Our most popular rings now available in 14K gold. This ring will be an heirloom for generations to come. The perfect present for the mother of three. Personalized mother's name rings now in gold! 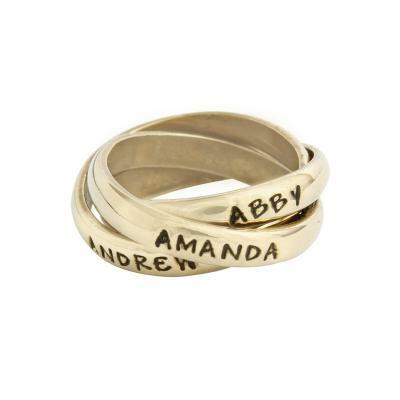 This name ring is perfect for families with three children. The overlapping custom stamped bands create a beautiful ring which is subtle and meaningful. Dimensions: The 14K gold bands are approx 3mm wide and can be stamped with up to 9 characters/spaces. Please note the rings are intertwined and move around constantly and switch positions. I love my triple band Mother's ring from Nelle and Lizzy. Absolutely beautiful. I don't want to take it off!